So, my last post was about my clothesline which makes you feel all warm & sunny… However… A quick glance at the calendar reminds me that winter is fast approaching around here! Colder days are coming. Days when the kids won’t be able to comfortably play outside… Days when all the doors & windows will be closed, the heater running. Days of being cooped up, snowed in, all covered in clothes from your toes to your nose. Sigh… Maybe it’s because I’m pregnant & nesting comes earlier and earlier with each Nut we add to this bowl of Granola. But, I’ve started storing up for the long winter months. Not just food in the freezer… not collecting the seeds my garden’s produced… though I’ve been doing that as well. What I’m busy with now is building a stash of activities for those little Nuts who will be going mad during the winter if I don’t provide interesting things to do occasionally to get their imaginations working. 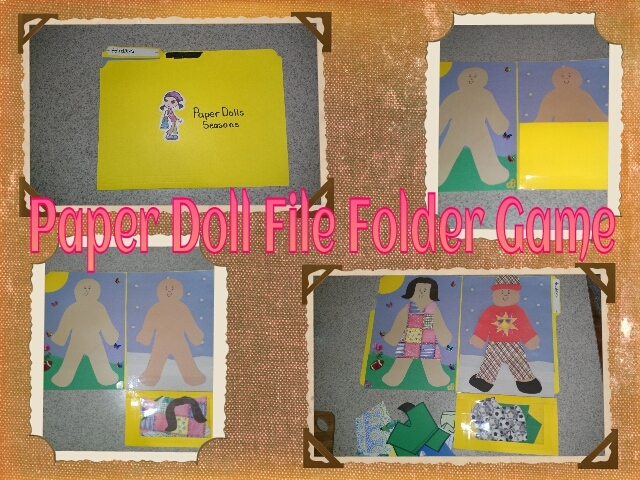 I found a whole passel of “File Folder Game” ideas on Pinterest (here’s a link to my File Folder Game Pin Board) … gosh, I could spend a whole day perusing that site! I came up with A LOT of ideas & printables which I’ll send with my Mr. to his office to print. But I’ve been making a few of my own as well and it’s totally been fun! Today I got the kids involved making a Paper Doll one. It’s my favorite one so far! I don’t have a printable for you (should I work on that?) because I just cut everything out of scrapbook paper, thanks to a good friend of mine who bequeathed to me her entire scrapbooking collection last year! If you don’t have paper you can get some construction paper here, or various pretty papers here, here or here! I also made a color matching one (Free Printable Here : Color Matching.TheyCallMeGranola.FFG)… For extra fun use these fun rocks to match colors or these glass beads which would be fun to use for all sorts of color and counting practice! They were totally easy & quick to make and my oldest absolutely loves them. I think in order for Monster (2 1/2 year old boy!) to use these I’ll need to laminate things for him (or cover with packing tape since I don’t have a laminator). UPDATE: I now own this laminator and can I just say – I LOVE IT! So easy to use! it makes stickers too which I could totally become addicted to! FYI… the printables look a little different as I just made them on the computer. Same idea though. Feel free to share freely, but do not use the printables for profit please. I hope that you can use these to keep your kids occupied this winter. I purchase my plain manila file folders here and my fun colored file folders here! 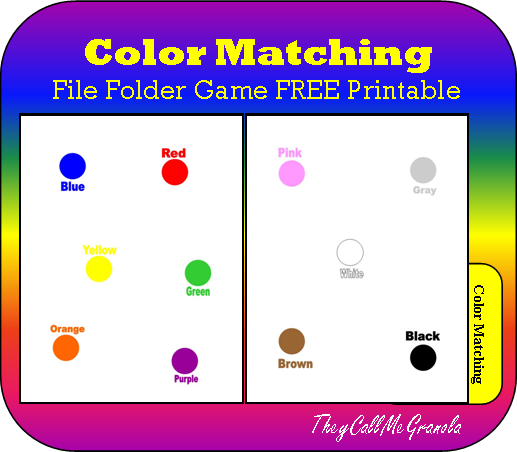 Do you have any free File Folder Game Printables you made that you’d be willing to share? Also, please comment below if you’d like me to work on a Paper Doll Printable. I’d be happy to do it if there is interest! Hi my name is Susan Wheeler and I am a preschool teacher and I teach three and four year olds. 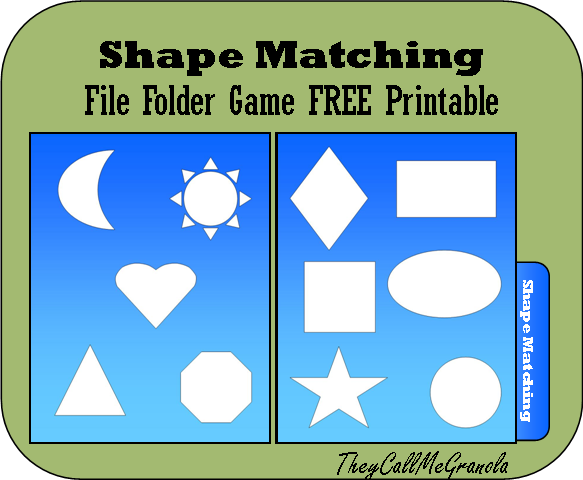 I am always looking for new ways to teach my children and I just want to say that you have some very good file folder games for teaching the shapes and I will be printing some of them off to use as games for my class I really appreciate you taking the time to share your ideas with me as well as other teachers. Great job on your work and again thanks. Thank you so much Susan! I’m blessed by your encouragement! I’m glad I could offer something you can use in your class! If you have a blog, feel free to link back a post if you make one using the file folder games! I’d love to see them in action! Thanks for linking to my games! I appreciate that. I’m not actually actively blogging right now so I can’t link your posts at this time. Sorry.